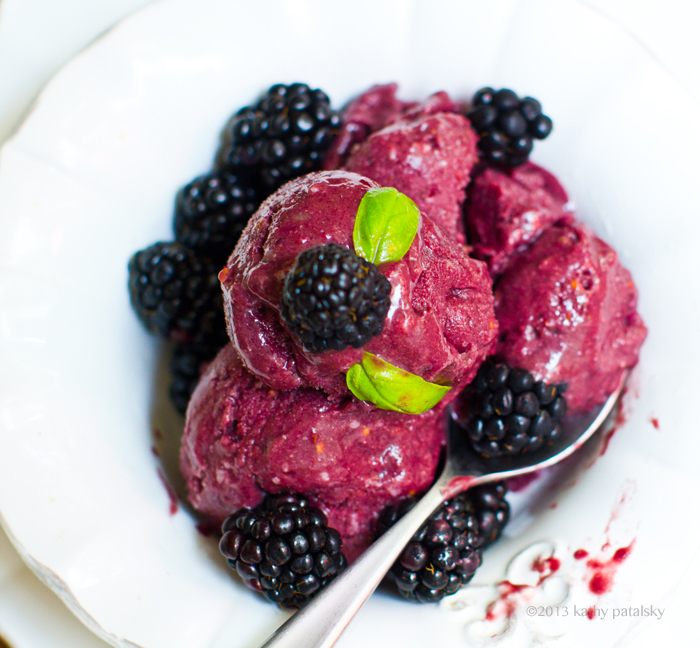 Creamy Fresh Blackberry-Acai Sorbet. 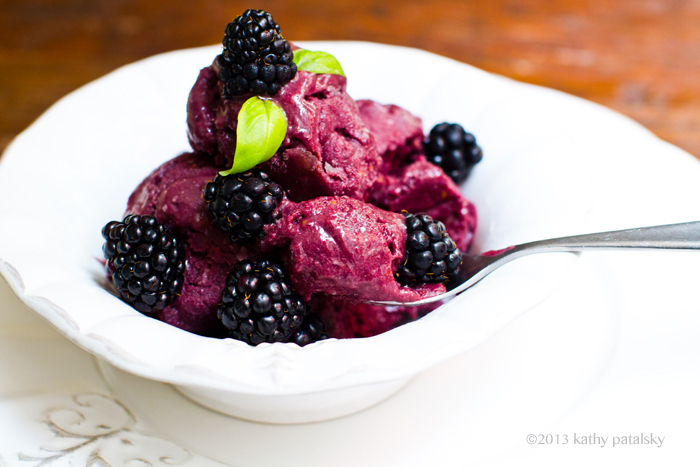 Blend, Freeze, Scoop, Serve! I don't care who you are or what your taste buds tell you on a normal day. When a HOT weather day hits your city and the beaming sun zonks you into a sweltering zombie, you will suddenly find yourself face first, perched at your open freezer. Peering past the frozen peas, you will be in search of something cool and creamy to scoop into a bowl. Spoon in hand, you will rustle past the frozen spinach, under the frozen pizza, hoping and wishing that you hid away some sort of a frosty, creamy, frozen dessert treat long ago that you simply forgot about. Well stop searching and start blending. The answer to your creamy-frosty spoonful dreams is right under your nose. Make sure you have frozen bananas and a few other goodies in your kitchen and you are just a few minutes away from cool bliss. 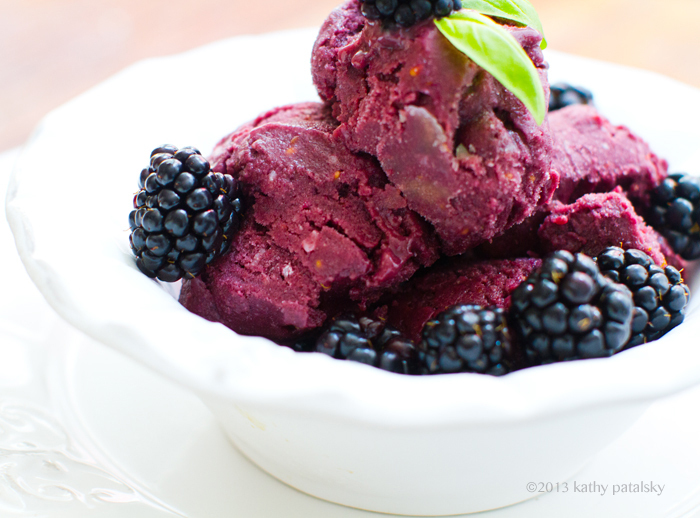 And the best part is that this creamy sorbet is incredibly healthy and totally guilt-free. Eat a giant, mountainous bowlful and feel GOOD about it. Antioxidants, fiber, vitamins and fresh fruit energy. 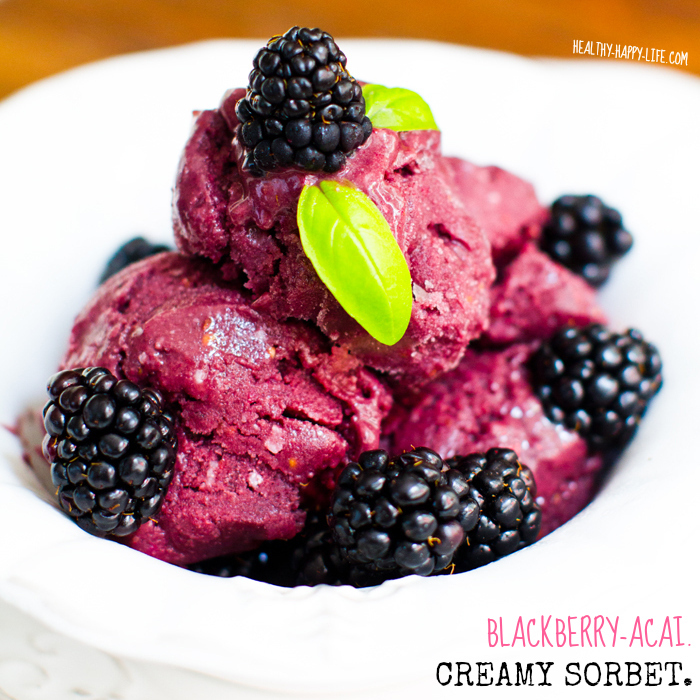 But this is a new flavor that I just love so much because it uses fresh spring/summer organic blackberries as the main flavor ingredient. 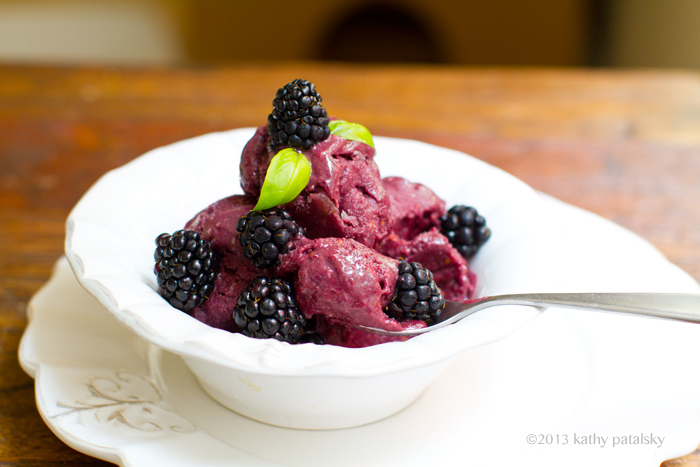 Not frozen berries - but fresh ones - big difference. 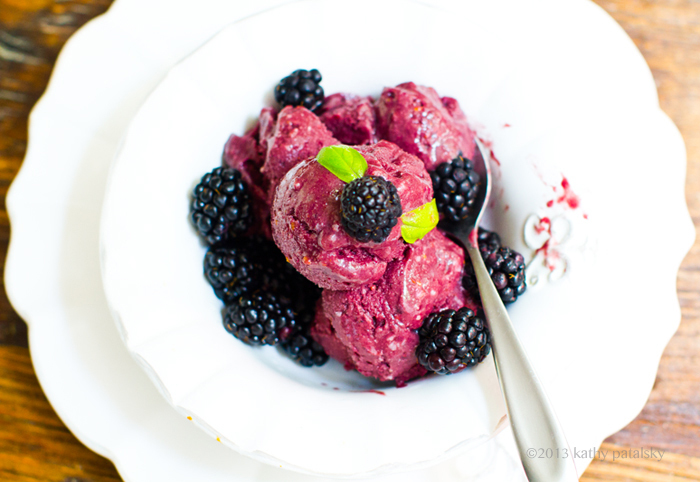 Sweet-tart-juicy blackberries really make me swoon so I love that I can taste them in every spoonful of this creamy sorbet. If you don't have fresh blackberries and need to switch out the fresh berry variety, try fresh blueberries, raspberries or even strawberries. Before you begin: place a stainless steel dish in the freezer. 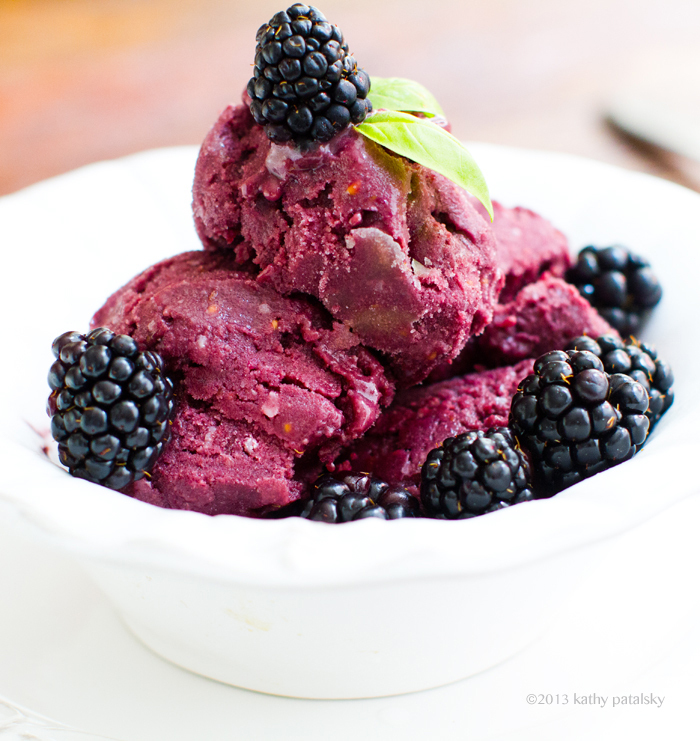 This will hold your blended sorbet and chill it very quickly. I used a medium stainless steel bowl. 1. 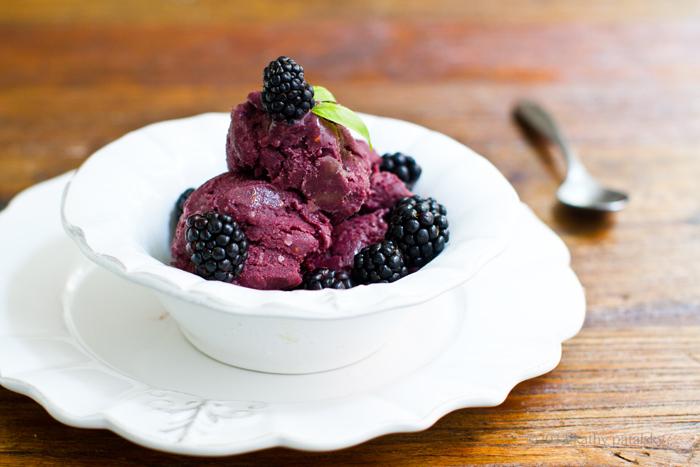 Add the blackberries, acai pack and banana to a high speed blender or food processor. 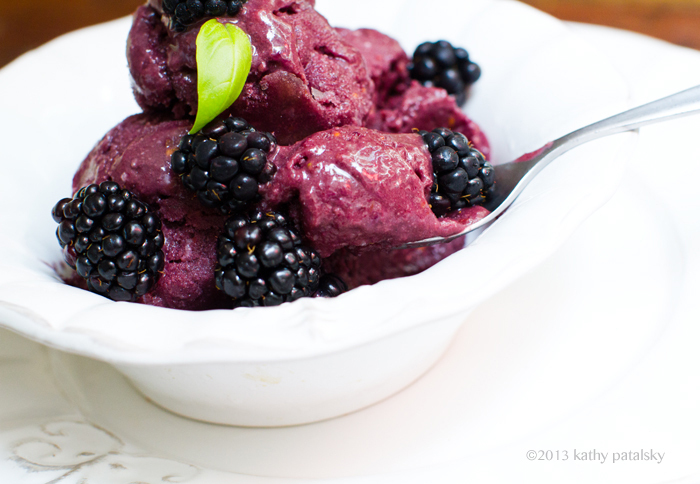 Blend until the berries are crushed and things start to crumble down. 2. While blending on low, slowly pour in the splash of lemon juice, zest and 1 Tbsp creamy liquid/vegan milk. If your blend begins to swirl into a creamy state after 1 Tbsp you can stop there. Otherwise, keep adding in spoonfuls until things blend creamy yet still as thick as possible. Do not rush to adding in liquid. Let the blender do its job for a good minute or so. If things get too wet and your blend starts to look like a smoothie, toss in another 1/2-3/4 of a frozen banana. Too thick? Too loosen the blend you can toss in a few extra fresh berries - this is a gentler way of loosening the blend compared to liquid. 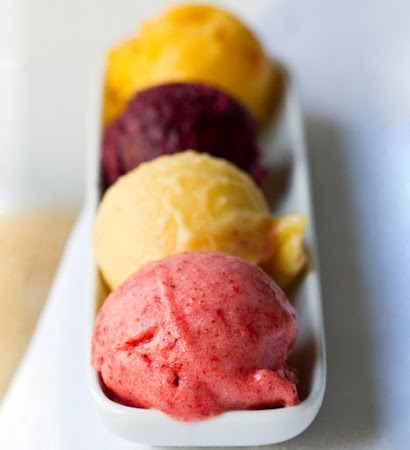 creamy-sorbet-soft-serve process does take some practice, but the key is to let your blender do all the work and really not underestimate its powder. Even with very little liquid, a Vitamix can crush those fruit ingredients and turn them into a thick swirl. Those few splashes of liquid help move things along and ease the stress on the blender just a bit. 3. Using a small rubber spatula, quickly spoon your thick mixture into your chilled container and place it in the freezer. 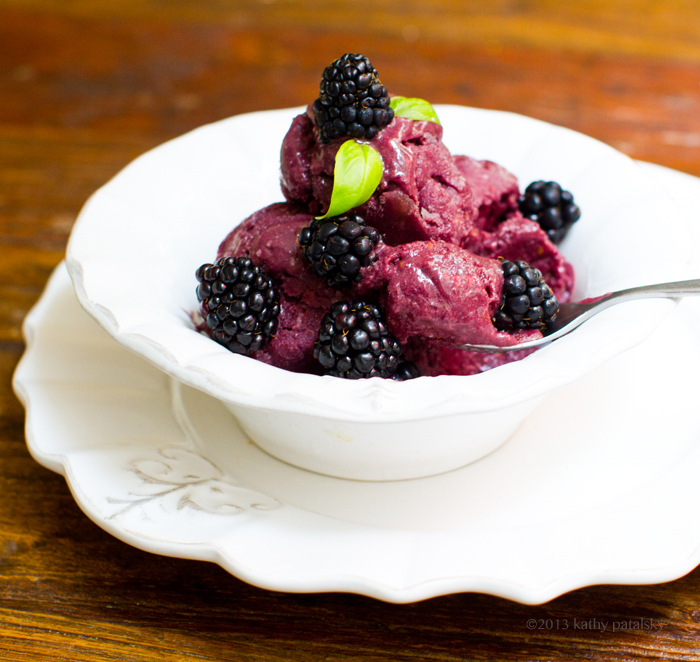 Your creamy sorbet should be at a perfectly "soft serve" state to scoop in jut about 10-15 minutes depending on how cold your freezer is. If you are keeping this blend in the freezer for longer than that (say overnight) the texture upon serving will not be as fluffy, but still doable - just be sure to allow enough thaw time in order to be able to scoop. 4. Serve with fresh basil on top.I like to add another pinch of lemon zest too. You can even add a drizzle or maple or agave syrup for extra dessert-y sweetness.